The WinStar globe is a striking and iconic landmark! From the moment you take Exit 3 off I-35, you see the globe shining brilliantly. It is unique, beautiful and the perfect spot to take a photo. And like WinStar, the globe has an impressive history many have never heard. In early 2010, Hnedak Bobo Group, the architecture firm working on the WinStar expansion, started dreaming with the Chickasaw Nation and WinStar. The team cast a vision to replicate an engineering marvel built as the centerpiece of the 1964-65 World’s Fair, the Unisphere. This replica would be placed at the new grand entrance so it would be visible from I-35 and upon entering WinStar. The Unisphere, located in Queens, New York, is still the largest sphere of its type on earth, standing at 120 feet tall; the replica model located at WinStar World Casino and Resort, though smaller, still towers at nearly 50 feet tall. By late 2010, the Chickasaw Nation and WinStar began to move forward to develop the globe and engaged Electric Gizmos & Display Systems LLC (E-GADS!) to engineer, manufacture and install the giant globe. The road to get the globe to WinStar was paved with many obstacles and hurdles along the way, but the E-GADS! team did not disappoint. Jennifer Bell at E-GADS! shared, “The WinStar globe is a is a project we are incredibly proud and fond of,” and all of us at WinStar feel the same way! E-GADS! worked for weeks drawing and engineering the globe to be as true to the original as possible. Like the Unisphere, WinStar’s globe has three orbital rings. The three rings each have deep meaning and strategic placement. The first represents the orbit of Cosmonaut Yuri Gagarin, the first Russian Cosmonaut to orbit the earth. The second represents Astronaut John Glenn, the first American Astronaut to orbit the earth. The third ring represents Telstar, the first active communications satellite to orbit the earth. Each continent is built at perfect scale to the earth and features terrain markers such as the Rocky Mountains, the Amazon River and Mount Everest. E-GADS! went through several different materials to create the globe. From stainless steel to aluminum to fiberglass, they worked around the clock to choose a building material that would work for the project. When it seemed they had exhausted every option, the project team found a surprising source of inspiration, traffic lights! Traffic lights support weight and stand up to years of abuse from the weather, yet they remain rust free. Building the globe using American-sourced steel was deemed the perfect method. Because of the materials used and the process for galvanizing steel, the E-GADS! team decided they would need to assemble the globe twice. The first time, it was constructed outdoors at the E-GADS! production facility located just blocks from the Las Vegas Strip. Frequently, visitors would spot the globe from their hotel rooms on the strip. It wasn’t long before lines of traffic formed with spectators wishing to have their photograph taken with the globe. Once fabrication was complete, the globe was completely dismantled and loaded onto eight wide load trailers and shipped to Los Angeles, California. The globe was the largest galvanizing project in the nation to ever take place. Upon completion, the globe was loaded up and shipped to Thackerville, Oklahoma to reside in its permanent home. In the summer of 2011, WinStar’s iconic entry piece was delivered to the property and installed for the world to see. At WinStar World Casino and Resort the globe stands proud and sees its fair amount of press. It has been featured in more than 20 different industry publications and is frequently found on social media and featured photos. 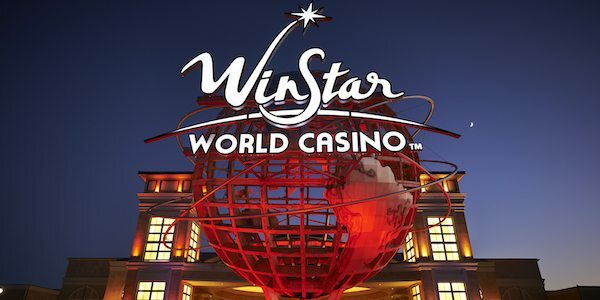 Unlike the Unisphere in Queens, NY, the WinStar World Globe has traveled through half a dozen states including Nevada, California, Arizona, New Mexico, Texas and Oklahoma. The Unisphere was commissioned to celebrate the beginning of the space age. It represents peace through understanding. WinStar World Casino’s globe commemorates the property’s expansion and is a tribute to American can-do workmanship, visionaries and all the excitement the world brings. On your next visit, whether you’re staying for a few days or just passing through, you will see the globe in a whole new way. Be sure to snap a pic with the globe to post on Instagram (@winstar_world) and hashtag #winstarworldcasino!